GEORGIA: Democrat Lucy McBath Flips US House Seat - Joe.My.God. Karen Handel has conceded the Georgia’s 6th Congressional District race to Lucy McBath Thursday morning. The 6th District matchup drew far less national attention than the last time the district was in play, when Handel, Georgia’s former Secretary of State and a former Fulton County Commission chair, fended off a star-studded challenge from political newcomer Jon Ossoff. After carefully reviewing all of the election results, it is clear that I came up a bit short on Tuesday. Congratulations to Representative-Elect Lucy McBath & I send her only good thoughts and much prayer for the journey that lies ahead for her. 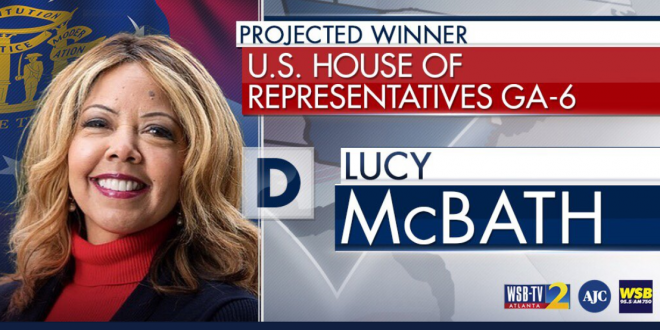 U.S. Rep. Karen Handel, R-Roswell, just conceded defeat and congratulated Democrat Lucy McBath. Handel will have served just 18 months in Congress.